After nearly 2 years out with a knee injury, David Rudisha looks to be back at his best. After storming to 800m gold at London 2012, in a world record time of 1:40.91, he added the world championship title in 2015. The 27-year-old Kenyan, who has run 6 of the 8 fastest times in the 800m, is now looking to become the 4th athlete to win back-to-back Olympic crowns in the event, after Douglas Lowe (Great Britain, 1924-1928), Mal Whitfield (USA, 1948-1952) and Peter Snell (New Zealand, 1960-1964). 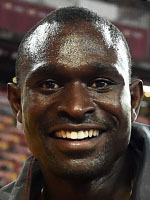 Dubbed the "Pride of Africa", Rudisha will be counting on his devastating sprint finish to get the better of his rivals in Rio - notably Botswana's Nijel Amos, who had to settle for silver in London.